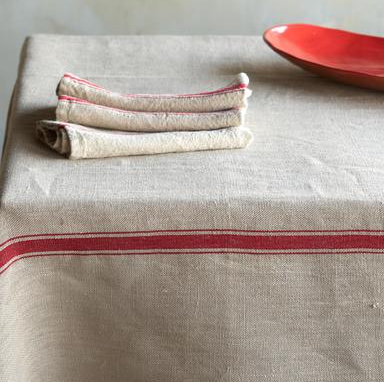 J'adore these natural table linens from Sundance. Although they aren't made in France, they look so much like a few of the things I already purchased for La Maisonnette. The simple, French-inspired pattern on this cloth makes for such a classic piece. Mmm...love it. beautiful simplicity! i would love to use these on a thanksgiving table. so pretty! Oh my gosh this is exactly what I've been looking for. Thanks! Oh, so nice. I dream of the day I can use white linens again on the table. Then I'll be dreaming of the days I couldn't I suppose. Beautiful. I love the Sundance catalog and store, and as a matter of fact, I'm going over to Corte Madera (Bay Area) to buy some goodies today, maybe that table cloth will be in the store! So beautiful yet so simple! I am still in mourning over not winning the giveaway. Lucky ducks! Check out my blog on how I want to treat you to a hot chocolate from Starbucks! these are just beautiful. I'm unfortunately still in the white (white enough to bleach) or patterned table cloths stage until the kids get a bit bigger and I'm not so afraid of them staining my linens!